Have a cold or the flu? Sprained your ankle? Need to see a specialist? You use your BCBSRI health plan! However, your plan is working for you even when you aren't at the doctor's office. Here’s a look at 14 advantages of being a BCBSRI member—features that help you stay healthy, save you money, and make using your plan easy and convenient. Don’t miss out on this visit, which helps your doctor focus on keeping you well and preventing future health problems. When you see a doctor in the BCBSRI network, the checkup is covered at no additional cost to you. So call your primary care provider today! Our wellness program, powered by Virgin Pulse, makes fitness contagious. Earn points and get motivated with healthy team challenges, customized nutrition tools, and trackers for activity, weight, sleep, and mood. To get started, go to join.VirginPulse.com or download the app. ** Choose Blue Cross & Blue Shield of Rhode Island as your sponsor, then connect your Fitbit® or other wearable device to track and sync steps with the app. Questions can pop up anytime. That’s why we offer customer service 7 days a week. We’re happy to talk with you Monday through Friday, 8:00 a.m. to 8:00 p.m., and Saturday and Sunday, 8:00 a.m. to noon. Call us at (401) 459-5000 or 1-800-639-2227 (outside of Rhode Island). Receive secure messages about your health and health plan on your mobile devices, including benefit updates, money-saving tips, and reminders about tests. To get started, text “BCBSRI” to 73529 or call 1-844-779-8820. Are you caring for a loved one, or is someone helping you? Discover resources available through your plan and in the community. Visit our site for caregivers. 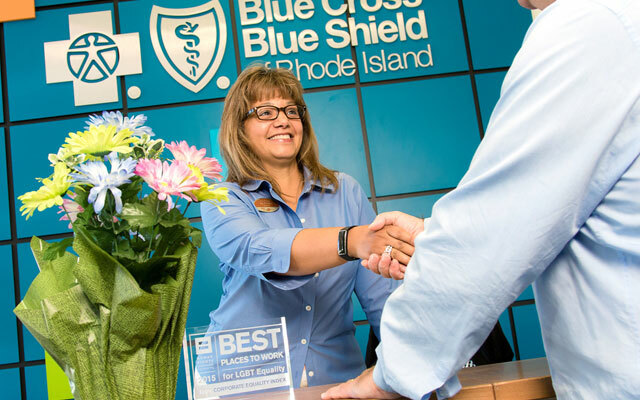 We partner with doctors and other healthcare providers to ensure you receive high-quality care at lower costs than you'd pay without your BCBSRI plan. When you receive a "Healthcare Services Summary" from us in the mail, it'll show how much you saved on each service. Higher costs don’t always mean higher quality. You could save hundreds or even thousands of dollars depending on where you receive care! By using My Cost Calculator, you can get a price estimate before your next healthcare service. Log in to bcbsri.com and click "My Cost Calculator." At Your Blue Store locations, you can take fitness classes such as yoga and Zumba. RSVP for a class. Looking to join a fitness center or lower your costs? As a BCBSRI member, you can receive the lowest available membership rate offered by thousands of participating gyms nationwide. To learn more, please call 1-800-866-8466. **Standard mobile phone carrier and data usage charges apply. The downloading and use of the mobile app is subject to the terms and conditions of the app and the online stores from which it is downloaded.